Tuesday’s NFL franchise tag deadline came and went without the Seattle Seahawks using it — the most recent time they did was in 2010 on kicker Olindo Mare. It wasn’t a surprise — Seahawks general manager John Schneider had said last week at the NFL Combine that Seattle wasn’t likely to tag anyone. Still, the passing of the deadline brings a little more clarity to Seattle’s situation as the free agent signing period begins next Wednesday. The only player it was thought the Seahawks might use the tag on was defensive tackle Sheldon Richardson. But Seattle declined, which means Richardson will now become a free agent March 14 unless he comes to an agreement with the Seahawks before then — teams can re-sign their own players at any time. Seattle has 16 players scheduled to become unrestricted free agents on March 14, led by Richardson, tight end Jimmy Graham and receiver Paul Richardson (though it’s worth noting that players can actually begin to agree to deals with other teams on Monday). The Seahawks enter the free-agent period lagging in cap space relative to most teams. Seattle has $12.6 million in cap room, according to OvertheCap.com, which ranks 26th among the 32 NFL teams. Seattle is likely to make some moves (possibly trading Michael Bennett, releasing Jeremy Lane, to name the two most obvious) to clear more cap room. But unless they make some unexpected transactions, the Seahawks aren’t likely to rank in the top half of available cap space. And while they will have room to do some things, they won’t have the space to make the kind of splash other teams will. But what the Seahawks have to sign outside free agents will also depend greatly on how aggressively they go about re-signing their own players. With the tag deadline passed, here’s a review of Seattle’s pending unrestricted free agents who were on the 53-man roster at some point last season. 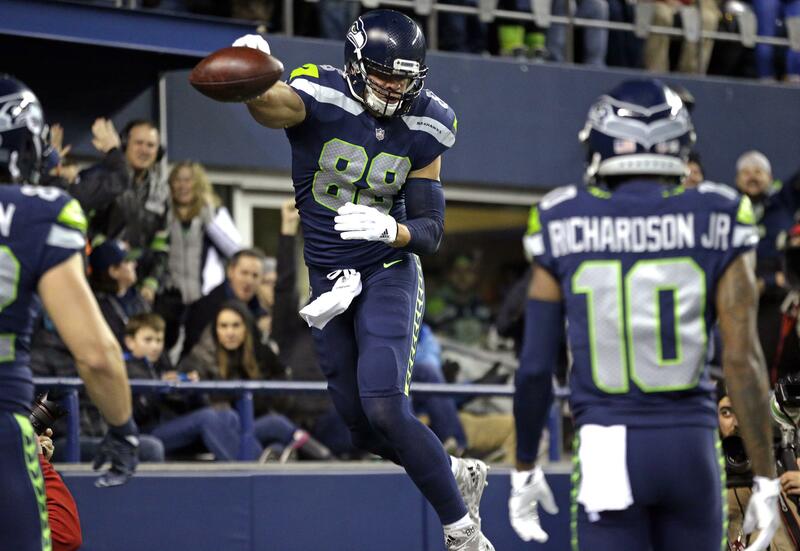 TE Jimmy Graham: Not expected back in Seattle after making $10 million a year ago. Could be headed back to New Orleans. The Seahawks will hope he gets the kind of contract that could net them a third-round compensatory pick in 2019. DL Sheldon Richardson: Now sure to be a UFA and figures to have a significant market in what is regarded as a weak crop of free agent defensive tackles. The Seahawks are talking to his agents and hoping to get something done, but the best bet is that he reaches free agency and sees what else is out there. Seems even more likely than Graham to get the kind of big deal that would get Seattle a third-round comp pick in 2019. CB DeShawn Shead: At the end of the season, it was unclear if he was a free agent, but it has since been learned that he will be an unrestricted free agent. He may be more of a priority to re-sign now that the Seahawks have said he could also again be used at safety. His experience and versatility could be especially valuable with Kam Chancellor uncertain to return and possible other changes in the secondary. OL Luke Joeckel: Afull-time starter at left guard in his first season with the Seahawks, but it’s unclear how new offensive line coach Mike Solari views him (former offensive line coach Tom Cable memorably said in a radio interview he thought Joeckel played as well as any guard in the NFL in 2016) and Seattle may explore other options to fill this spot. FS Bradley McDougald: A really valuable player in his first year with Seattle, starting nine games at safety. With Chancellor’s situation remaining murky, McDougald seems like just about a must for Seattle to re-sign. TE Luke Willson: With Graham almost certainly gone, Willson may be more of a priority to re-sign since there are only two other tight ends on the roster— Nick Vannett and Tyrone Swoopes. WR Paul Richardson: The WR free agent crops grew a little deeper with the decisions of the Rams not to tag Sammy Watkins and the Jaguars not to tag Allen Robinson; that may mean a market not quite as rich for Richardson. Conversely, he’s regarded as one of the best deep threats available in a free agent crops not exactly teeming with them, so he won’t be easy for Seattle to re-sign. PK Blair Walsh: Won’t be back. Seattle has already signed Jason Myers as a possible replacement and is likely to sign or draft another kicker in time for camp. DE Marcus Smith: A serviceable backup who wouldn’t seem to have a big market, which means he could be easy to get back if Seattle wants him. OL Oday Aboushi: Started eight games at guard before a season-ending shoulder injury. Could be back as depth, though it’s hard to read what Seattle will do on the offensive line with Solari now in charge. OL Matt Tobin: Played sparingly after being acquired in wake of George Fant’s injury, but has a lot of versatility that Seattle may want to retain. LB Terence Garvin: Backup LB and also a solid special teams player a year ago, but with Ken Norton back — he’s the de facto linebackers coach as well as the new defensive coordinator — there could be some shaking up of the LB corps. QB Austin Davis: Played just two snaps all season but could return as the backup, as he started eight games for the Rams in 2014 when new offensive coordinator Brian Schottenheimer was the OC with St. Louis. Seattle has also already re-signed Trevone Boykin, whose legal issues have also cleared up since the end of the season. CB Byron Maxwell: Played well down stretch in second stint with Seahawks, and has said he’d like to be back. Probably won’t cost much. The Seahawks also have five players who are restricted free agents, meaning they can give them a qualifying offer that means it can then match any offer the player receives or potentially get compensation if he leaves. If Seattle does not get a qualifying offer, the player becomes an unrestricted free agent. RB Thomas Rawls: Former rookie sensation had just 157 yards and may not be worth the tender amount. But recall that Seattle didn’t tender Christine Michael in 2016 and then brought him back as an unrestricted free agent. A similar scenario could be in place for Rawls, assuming each side wants him to return. CB Justin Coleman: A starter at nickelback much of the season; would seem likely to be a priority for Seattle to retain. RB Mike Davis: Became the starting tailback late in the season, and it would seem likely the Seahawks would want him back one way or another, though probably not with a tender. Instead, they could let him become a UFA and then re-sign him, à la Michael and potentially Rawls. DE Dion Jordan: Made a big impact down the stretch and would seem almost a certainty to return, if not a priority, especially if Michael Bennett is traded. LB Dewey McDonald: Had ACL surgery after playing four games; his health alone figures to mean the team will let him become unrestricted. Seattle also has 12 exclusive-rights free agents, meaning that they have to stay with the Seahawks as long as the team gives them a qualifying offer. ERFA players are DLs Quinton Jefferson, Branden Jackson and Garrison Smith; LBs Paul Dawson and Josh Forrest; center Joey Hunt; DB Jordan Simone; RB J.D. McKissic; long snapper Tyler Ott; TE Tyrone Swoopes; and OL Tyrus Thompson. Akeem King, a practice squad player last season previously listed as an ERFA, is also now listed as a UFA. Published: March 6, 2018, 7:20 p.m. Updated: March 6, 2018, 8:48 p.m.